By Keith Cowing on February 28, 2017 11:58 PM. "A senior administration official also said references to NASA and space travel were dropped at the last-minute due to timing. "We wanted to keep the speech to an hour," this person said." 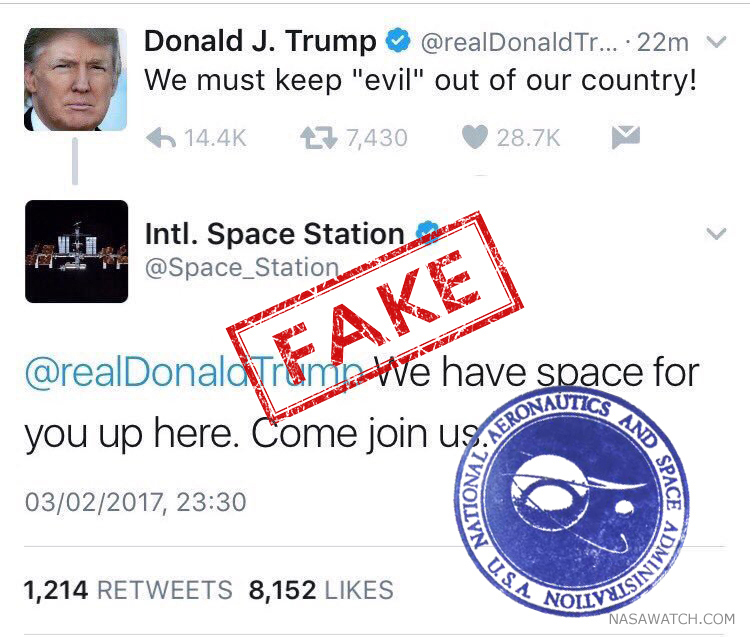 Whatever Trump announces to increase support for human spaceflight will come at the expense of other things that #NASA does. By Keith Cowing on February 28, 2017 6:46 PM. "A more blunt assessment was offered by Mary Lynne Dittmar, who is familiar with the thinking of NASA's human spaceflight program managers. "I find it extraordinary that these sorts of announcements are being made when SpaceX has yet to get crew from the ground to low-Earth orbit," she told The New York Times. Dittmar serves as executive director of the Coalition for Deep Space Exploration, the organization formed by the principal contractors behind NASA's SLS rocket and Orion spacecraft. These are the old-guard aerospace firms, including Boeing and Lockheed Martin, whose government contracts are threatened by SpaceX. Orion, in particular, appears to be particularly vulnerable if SpaceX can show that Dragon is capable of performing the same kind of deep space missions and high velocity returns from the Moon. With his latest proposal, Elon Musk is playing a dangerous, but potentially winning, game with his lower-cost alternatives to NASA's existing programs. He recognizes that NASA has nurtured his company, and on Monday night, he remained publicly appreciative of the space agency. However by talking about Mars and now the Moon, he not only indicates that his company isn't entirely focused on its most important contract - commercial crew- but also is making a play for NASA's future deep space exploration plans." Keith's note: FYI The Coalition for Deep Space Exploration is not an "organization". It is not incorporated anywhere. Dittmar is paid with funds that come directly from these aerospace companies. It is hypocritical in the extreme for her to criticize SpaceX for having not done things when in fact SLS has never flown and a stripped-down Orion test article flew just once on a rocket that it will never fly on again. 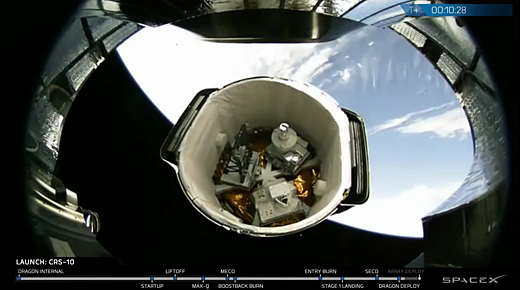 Meanwhile, Dragons launched on Falcon 9 rockets have made multiple visits to ISS and Falcon Heavy, composed of three of those Falcon 9's, has a significant flight record and is slated to launch this year - years ahead of SLS. SLS will fly only once every several years until the middle of the next decade - and only once or twice a year after that. Meanwhile Falcon 9s will soon be flying monthly. NASA studies looking at moving a crew onto EM-1 will soon show just how expensive and inflexible SLS/Orion actually is while the Falcon/Dragon product line continues to expand its capability without the ever-increasing costs that plague SLS/Orion. No one is going to get (back) to the Moon fueled with alternative facts and snake oil. By Keith Cowing on February 28, 2017 2:33 PM. By Keith Cowing on February 27, 2017 8:33 PM. "President Trump will instruct federal agencies on Monday to assemble a budget for the coming fiscal year that would include sharp increases in Defense Department spending; major cuts to other agencies, including the Environmental Protection Agency; and no reductions to the largest entitlement programs, Social Security and Medicare, according to four senior administration officials. The outline, drafted by the Office of Management and Budget director, Mick Mulvaney, is the first volley to the federal agencies. Departments will have several days to comment on the plan, and congressional leaders will be alerted ahead of Mr. Trump's speech to a joint session of Congress on Tuesday night." By Keith Cowing on February 27, 2017 6:40 PM. "We are excited to announce that SpaceX has been approached to fly two private citizens on a trip around the moon late next year. They have already paid a significant deposit to do a moon mission. Like the Apollo astronauts before them, these individuals will travel into space carrying the hopes and dreams of all humankind, driven by the universal human spirit of exploration. We expect to conduct health and fitness tests, as well as begin initial training later this year. Other flight teams have also expressed strong interest and we expect more to follow. Additional information will be released about the flight teams, contingent upon their approval and confirmation of the health and fitness test results." "We will work closely with SpaceX to ensure it safely meets the contractual obligations to return the launch of astronauts to U.S. soil and continue to successfully deliver supplies to the International Space Station. "For more than a decade, NASA has invested in private industry to develop capabilities for the American people and seed commercial innovation to advance humanity's future in space. "NASA is changing the way it does business through its commercial partnerships to help build a strong American space economy and free the agency to focus on developing the next-generation rocket, spacecraft and systems to go beyond the moon and sustain deep space exploration." Just remember folks: SLS & Falcon Heavy have never flown. Orion & Dragon2 have never flown w/crew. Both rockets are delayed. Things happen. Keith's note: It is rather strange that NASA would issue a press release about this private commercial venture since this mission does not involve NASA in any way - other than using the launch pad that they rent from NASA and a self-purchased version of the spacecraft they let NASA use. This strikes me as a "well, we need to say something - don't we?" sort of press release from NASA. I guess NASA wants to remind people that they still have big rockets - even if their version of a lunar mission with 2 people will cost many times what SpaceX will charge, will take years longer to accomplish (if the White House says so), and will likely not be repeated i.e. a one-off stunt. Oh yes: notice the the #JourneyToMars thing is no longer automatically put into every NASA press release. By Keith Cowing on February 25, 2017 8:52 PM. Keith's note: According to her Wikipedia page Lesa Roe "is currently serving as the Acting Deputy Administrator of NASA. Roe is also the Deputy Associate Administrator of NASA, being in role since May 2014.". I cannot find any announcement from NASA or the White House that she was appointed to the position of Acting NASA Deputy Administrator. The Wikipedia page was last revised to add Roe's new position on 1 February 2017 by someone named "Hosgeorges" from the UK. On 22 February 2017 someone named دارين added a picture of Lesa Roe. Prior to that Roe's Wikipedia page was last changed on 8 May 2016. This senior leadership page on NASA.gov only mentions Robert Lightfoot as Acting NASA Administrator. But this page at NASA.gov (last changed on 10 February 2017) says "Deputy Administrator: Lesa Roe (acting)". So Hosgeorges in the UK knew about this NASA management change nearly a month ago - and NASA quietly added it to its website 2 weeks ago - but no one thought to put a memo out for the rest if us? But wait: there's more: This page links to a NASA Advisory Council page shows a group portrait of the NAC with former NASA Administrator Charlie Bolden and refers to "Mr. Kenneth Bowersox (NAC Interim Chair)". Yet this page mentions the NAC and says "Chair: General Lester L. Lyles (USAF, Ret.)" On 20 January 2017 Robert Lightfoot sent out a memo "Message from the Acting Administrator of NASA" which said "As the transition progresses, we have some initial assignments from the new administration. Erik Noble has been named White House Senior Advisor at NASA. Greg Autry, who was with the Agency Review Team, has been named White House Liaison." According to this current NASA Organization Structure page last updated 10 February 2017 Erik Noble is now "Chief of Staff (acting)". According to multiple sources Greg Autry told people that he would be leaving his White House Liaison position at NASA effective 17 March 2017. But he left on 23 February instead. Oddly, the page was last updated on 10 February 2017 yet made no mention of Autry despite the importance of his position at the time. Things are starting to get a little strange when NASA makes significant agency appointments like this and does not tell anyone else - except Hosgeorges and دارين that is. By Keith Cowing on February 25, 2017 1:02 PM. "As much as America's government space programs have accomplished, there are many aspects of our nation's space infrastructure that are crumbling every bit as badly as interstate highways. Take a tour of most NASA or Air Force space facilities and you will see buildings that predate Neil Armstrong's first walk on the Moon and that have been postponing badly needed maintenance since the end of the Cold War. Space is an inspiring part of America's history, but the country's space facilities should represent the technological state of the art, not a rusting time capsule from the 1960s." By Keith Cowing on February 25, 2017 10:24 AM. "If you'd read that feed for coverage of the two-and-a-half-hour hearing, you'd be forgiven for thinking Stofan didn't show up at all. ... Where was she? Missing from more than the photo, it turned out. The House committee's Twitter account--the same one that has shared false climate-change information from Breitbart News--didn't mention her at all in its tweets covering the hearing." While the other witnesses talk about Apollo, big rockets, and human exploration @EllenStofan talks about everything else that @NASA does. Rep Beyer asks @EllenStofan what would happen if #NASA Earth science budget was deleted. Stofan goes into great detail about its value. Once again only @EllenStofan gets the questions about #NASA science while the other witnesses talk about humans in space. By Keith Cowing on February 24, 2017 12:03 AM. "NASA announces its annual invitation for public nominations for service on four new Federal advisory committees of NASA that advise NASA on science. The four new committees, formerly subcommittees of the NASA Advisory Council (NAC) Science Committee (NAC SC), have been established under the Federal Advisory Committee Act (FACA), and will advise four divisions of the NASA Science Mission Directorate (SMD). On December 2, 2016, NASA published a notice in the Federal Register announcing their establishment [Federal Register, Vol. 81, No. 232, pages 87082-87083]. U.S. citizens may submit self-nominations for consideration to fill vacancies on these four new committees. There will be member vacancies from time to time throughout the year, and NASA will consider self- nominations to fill such intermittent vacancies. Nominees will only be contacted should a vacancy be available and it is judged that their area(s) of expertise is appropriate for that specific vacancy. NASA is committed to selecting members to serve on these committees based on their individual expertise, knowledge, experience, current/past contributions to the relevant subject area and overall diversity of the committee. All member appointments are non-compensated. However, NASA does cover travel and per diem expenses for all member appointments. The deadline for NASA receipt of all public nominations is March 8, 2017." By Keith Cowing on February 23, 2017 12:38 PM. "Many of my old friends and colleagues are asking me a question these days: "If you were NASA Administrator, what would you have the agency do?" I know what they want to hear: Moon, Mars, or Asteroid - what is the next destination for human spaceflight? But that is not the answer I would give. Whatever 'horizon goal' is established, without significant organizational and cultural changes at NASA, the chance for success is in doubt. To make NASA into the extraordinarily effective organization it once was and could be again will require significant work to transform it. NASA is filled with extremely smart, highly motivated individuals who are the experts in their fields. They can do amazing things. Measured against any other organization - government or commercial - the NASA civil service and contractor work force is outstanding in terms of inherent capabilities and the desire to make their projects successful. But success in NASA's endeavors is hobbled by three structural and cultural problems: (1) inter-center rivalry, (2) mind numbing bureaucracy, and (3) a paralyzing cultural requirement for perfection in all things." By Keith Cowing on February 23, 2017 12:11 AM. "A few Fridays ago, Tracy Van Houten drove to a registrar's office to pick up the paperwork she would need to run for Congress. Doing so would mean giving up her role as an aerospace engineer at NASA's Jet Propulsion Laboratory - a dream job that she had held for 13 years. ... Van Houten is now officially running to represent the 34th Congressional District of California in the U.S. House. The seat's former occupant, Xavier Becerra, was appointed as attorney general of California last December, and 23 candidates are now vying to replace him in a special election, to be held in April. The roster includes experienced politicians, activists, and lawyers. Van Houten, who is something of a wildcard, is the only rocket scientist." By Keith Cowing on February 20, 2017 4:11 PM. By Keith Cowing on February 20, 2017 12:44 PM. By Keith Cowing on February 19, 2017 9:55 AM. SpaceX launched the CRS-10 mission on time this morning at 9:39 am ET from historic LC39A. 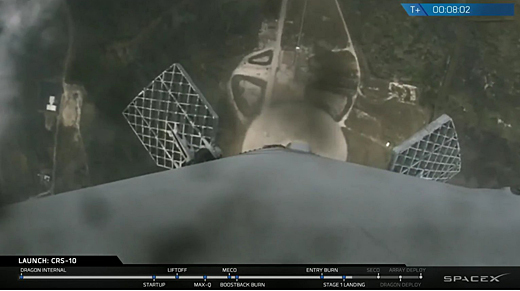 The Dragon is in orbit and heading toward the ISS while the Falcon 9's first stage made yet another pinpoint anding back at its landing site in Florida. By Keith Cowing on February 18, 2017 11:17 AM. This morning's attempted launch of Falcon 9 was halted moments before launch. According to a statement from SpaceX "Standing down to take a closer look at an engine actuator on the second stage. 9:38am ET tomorrow is our next earliest launch opportunity." By Keith Cowing on February 17, 2017 11:28 AM. "The orbital period does not affect the quality of the science collected by Juno on each flyby, since the altitude over Jupiter will be the same at the time of closest approach. In fact, the longer orbit provides new opportunities that allow further exploration of the far reaches of space dominated by Jupiter's magnetic field, increasing the value of Juno's research. ... The original Juno flight plan envisioned the spacecraft looping around Jupiter twice in 53-day orbits, then reducing its orbital period to 14 days for the remainder of the mission. However, two helium check valves that are part of the plumbing for the spacecraft's main engine did not operate as expected when the propulsion system was pressurized in October. Telemetry from the spacecraft indicated that it took several minutes for the valves to open, while it took only a few seconds during past main engine firings. ... Juno's larger 53-day orbit allows for "bonus science" that wasn't part of the original mission design." Keith's note: So NASA's Juno spacecraft has engine problems that prevent it from accomplishing its planned i.e. optimal science mission. But that's OK since NASA says that none of the science is affected by the engine problems. Indeed, they say that the science is better - and they get "Bonus science" too! Bonus science is good, yes? But wait: if Juno's science is not affected by engine failures - indeed its now better without the engine firings - then why did they plan the engine firings and orbit changes in the first place? By Keith Cowing on February 17, 2017 9:43 AM. "President Trump should order the Secretary of Defense to position American assets and shoot down Kim Jong Un's next missile launch. Intercepting a North Korean missile would signal to Pyongyang that America has the capability and the willingness to defend our allies and the homeland. In the parlance of military strategy, the missile defense option enhances deterrence-by-denial. North Korea is more likely to be deterred from developing missiles if robust, layered missile defenses deny them any strategic benefit from striking first. The only two alternatives are preemptive offensive action and, of course, more strongly worded UN Security Council resolutions and toothless sanctions." Keith's note: If a North Korean rocket threatens U.S. assets - or even seems to be doing so - we should defend ourselves. No argument there. Bridenstine has a military background and it is natural that he'd have concerns about issues such as this - and speak out about them. When I have heard him speak about space he does well when it comes to military, communications, and commercial space. But when it comes to NASA science - nothing but crickets. If Bridenstine is the nominee to become NASA administrator he clearly needs a Deputy and a strong AA and Center Director contingent to make up for his clear lack of science management experience. The fact that this "exclusive" op ed by Bridenstine appears on Breitbart News, the controversial former employer of Trump's avatar Steve Bannon should not be lost on people. This sort of op ed placement does not happen by accident these days. There is clearly an idealogical mind meld going on here - as well as the beginnings of a possible Alternate NASA PR machine - one independent of NASA PAO - in the making. 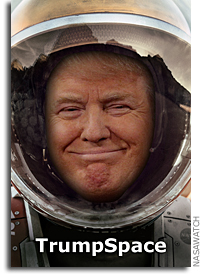 Is Trump Going To A Rocket Launch? By Keith Cowing on February 16, 2017 1:00 PM. Reader note from Kevin "I noticed a Temporary Flight Restriction (TFR) over Melbourne that looks identical to the TFR's over Palm Beach International the last two weekends for Trump's stays at Mar-a-Lago. The Melbourne TFR matches the SpaceX launch window suggesting POTUS will be viewing the launch. I wonder if POTUS will then announce a new space policy to return to the moon from Pad 39a, but this time with commercial rockets. See https://skyvector.com/ for details on the TFR's"
Keith's note: When I asked NASA PAO they said that Trump is not attending a launch but that he will be "close". By Keith Cowing on February 16, 2017 10:00 AM. Keith's note: Consider the ages of the witnesses for this hearing: Jack Schmitt, 81; Tom Stafford, 86; Tom Young, 80; and Ellen Stofan, 55. That's three male octogenarian NASA employees who have been retired for decades and one female who actually still worked for NASA until a few weeks ago. I have the utmost respect for Schmitt, Stafford and Young and their legendary accomplishments. But why does this particular congressional committee constantly look back at what was done half a century ago and yet spend so little time listening to people who still work at NASA? And what about the generation that will actually accomplish the things that NASA will be doing in the decades ahead? Is no one interested in what they think? This hearing is titled "NASA: Past, Present, and Future". Based on the witnesses it should have been titled "NASA: Past, Past, Past, and Present. No Future". By Keith Cowing on February 15, 2017 9:19 PM. "The White House is preparing a new executive order to require agencies to plan and suggest ways to reorganize the government. Federal News Radio has learned that a draft order is circulating in the government and could be issued this week after the expected Senate confirmation of Rep. Mick Mulvaney (R-S.C.) to be the director of the Office of Management and Budget. The draft order includes a series of requirements for agencies to quickly turn around plans to improve how the department meets its mission. The draft also details a list of elements the agencies need to include in those plans ranging from a list of programs that are duplicative to whether state and local governments or the private sector could do the work better to the costs of ending or merging the capabilities. The draft order also calls on agencies to determine if back-office functions are duplicative with other services within another agency, bureau or program and if so, could they be consolidated." "An internal NASA review team has produced proposals to enable the agency to meet the tough funding targets set by the Administration in the 1996 budget, Administrator Daniel S. Goldin said today. The proposals include sweeping management and organizational changes to cut spending an additional $5 billion by the end of the decade. "I'm pleased with what I've seen so far," Goldin said. "We've found ways to streamline operations, reduce overlap, and significantly cut costs without cutting our world-class space and aeronautics programs. We have much hard work before us, but I believe a stronger and more efficient NASA will emerge." By Keith Cowing on February 15, 2017 6:24 PM. "Related to that, I have asked Bill Gerstenmaier to initiate a study to assess the feasibility of adding a crew to Exploration Mission-1, the first integrated flight of SLS and Orion. I know the challenges associated with such a proposition, like reviewing the technical feasibility, additional resources needed, and clearly the extra work would require a different launch date. That said, I also want to hear about the opportunities it could present to accelerate the effort of the first crewed flight and what it would take to accomplish that first step of pushing humans farther into space. The SLS and ORION missions, coupled with those promised from record levels of private investment in space, will help put NASA and America in a position to unlock those mysteries and to ensure this nation's world preeminence in exploring the cosmos. There has been a lot of speculation in the public discourse about NASA being pulled in two directions - what has come before and what we want to do now. At NASA, this is an "and" proposition, not an "or." To get where we want to go, we need to work with the companies represented at the SLS and ORION suppliers conference AND those industry partners that work with us in other areas across the country - all of whom have the long-term view on this work. We must work with everyone to secure our leadership in space - and we will." Keith's note: Lots of implications from this sudden announcement - these come to mind. 1. Show me the money. NASA has been slipping SLS launches to right faster than the calendar itself moves. In so doing it is gobbling up financial resources that were already inadequate. To make this crew on EM-1 fantasy happen would require a pile of money that the SLS itself would have problems launching. 2. ASAP and other advisory panels are already on record questioning whether SLS's Interim Cryogenic Propulsion Stage (ICPS) can/should be human-rated since it is only going to be used once. Add in chronic SLS software verification problems at MSFC and there are already serious doubts that the very first SLS rocket will be launched on time without humans on board. Add in the complexity of humans and a system that is already struggling is going to become more bogged down. And there is no way that the Exploration Upper Stage (EUS) would be ready to support EM-1. 3. Lightfoot is being rather dismissive - and misleading - when he tries to gloss over the very real divisions within the Trump Administration with regard to NASA's direction. They are very real. One faction led by Newt Gingrich and Bob Walker is pushing strongly for a commercial-centric expansion of commerce from LEO to cis-lunar space, the lunar surface, and beyond. The other faction - headquartered in Alabama - is surgically welded to he SLS/Orion, big government spending status quo. Right now, where you stand depends on where you sit - and what you stand to gain - or lose. 4. Expected NASA Administrator nominee Bridenstine, a staunch commercial space advocate, has seen his nomination stalled by a variety of things - most notably a White House staffer who used to work for Rep. Mo Brooks (R-AL). Its the Alabama cabal - the pro SLS/Orion team at work trying to gum up the works. The longer Brindenstine's nomination is delayed, the stronger the hold Robert Lightfoot, a card carrying member of the Alabama SLS/Orion cabal, has on staying in the top job - or possibly as Deputy as a consolation to the Alabama cabal. Trump Administration Beach Head members are already being pulled into one camp or the other - and the leaks of internal differences on policy are making their way to the media. 5. Last week the Commercial Spaceflight Federation's chair unexpectedly announced that the CSF was suddenly dropping its long-standing objections to the government-built SLS, a direct inhibitor of / competitor to the commercial sector heavy lift market. Many members are upset at this sudden reversal and expect that these words of support will soon evaporate in the reality of hearings and budget stances. Moving humans onto the first SLS launch is a direct threat to commercial crew providers. By flying humans sooner this takes a lot of the wind out of the sails of commercial crew program. Given the less than enthusiastic support commercial crew had had, this could make it even harder to gain the funding needed to make commercial crew work the way that it is planned to work. 6. Whenever a NASA program - especially a big one like SLS and Orion - gets in trouble someone comes up with a Hail Mary pass to make it harder to kill. When I was at Space Station Freedom and Congress had its carving knives out we came up with something I heard called "Flag on orbit" - a node with a PV array and an antenna. 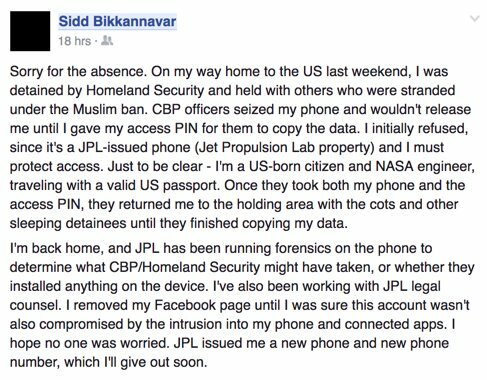 The thought being that once hardware was actually in orbit it would be harder for Congress to kill the program. Look at the FGB/Node configuration that did nothing for several years and you will see how this thinking continued. 7. If flying a crew on the first mission of SLS was a wise, prudent, strategically important thing to do then the program would have baselined it in the first place. I am not certain if I have ever seen a plan for SLS (Or Ares V) where this was planned. To move this rather important milestone up now in the midst of dueling and ever-shifting policy directions - for no clearly articulated reason other than politics - starts to smell like launch fever to me - the worst kind of launch fever. 8. Cuts to discretionary spending for agencies such as NASA seem to be forthcoming. If NASA budgets will be operating under a CR to be followed by flat levels and possible cuts, the money to pay to speed up human missions on SLS will need to come from somewhere within NASA's budget. Toss in the rhetoric about moving NASA earth science research elsewhere and/or decreasing funding for it and you have the makings of a perfect budget storm - one where the entire space community will be pitted against itself. Alas, this intentional chaos would be in synch with the new Administration's mode of operations. By Keith Cowing on February 15, 2017 9:40 AM. By Marc Boucher on February 14, 2017 3:07 PM. "The days of on-orbit servicing, or satellite servicing, living in obscurity are over. On February 7, Orbital ATK, Inc. and their subsidiary Space Logistics LLC, filed a lawsuit in the Eastern District of Virginia to stop the U.S. Defense Advanced Research Projects Agency (DARPA) from awarding Space Systems Loral (SSL), a subsidiary of Canada's MDA, a contract to to develop satellite servicing of spacecraft in geostationary orbit (GEO) for the Robotic Servicing of Geosynchronous Satellites (RSGS) program." "Orbital argues that the federal program, called the Robotic Servicing of Geosynchronous Satellites, would unfairly compete with its own privately funded effort, a system called the Mission Extension Vehicle 1, backed by at least $200 million from investors. The company has set up at a production facility in Northern Virginia, with a launch planned for next year." By Keith Cowing on February 13, 2017 9:43 PM. "Like similar groups across the country - in more than 20 cities - they believe that the Trump administration might want to disappear this data down a memory hole. So these hackers, scientists, and students are collecting it to save outside government servers. But now they're going even further. Groups like DataRefuge and the Environmental Data and Governance Initiative, which organized the Berkeley hackathon to collect data from NASA's earth sciences programs and the Department of Energy, are doing more than archiving. Diehard coders are building robust systems to monitor ongoing changes to government websites. And they're keeping track of what's already been removed - because yes, the pruning has already begun." "Earlier federal data hackathons include the "Guerrilla Archiving" event at the University of Toronto last month, the Internet Archive's Gov Data Hackathon in San Francisco at the beginning of January, and the DataRescue Philly event at the University of Pennsylvania last week. Much of the collected data is being stored in the servers of the End of Term Web Archive, a collaborative effort to preserve government websites at the conclusion of presidential terms." "The group was split in two. One half was setting web crawlers upon NOAA web pages that could be easily copied and sent to the Internet Archive. The other was working their way through the harder-to-crack data sets--the ones that fuel pages like the EPA's incredibly detailed interactive map of greenhouse gas emissions, zoomable down to each high-emitting factory and power plant. "In that case, you have to find a back door," said Michelle Murphy, a technoscience scholar at the University of Toronto." By Keith Cowing on February 13, 2017 10:52 AM. "Dear Members Of The JWST Family, It is with much sorrow that I must tell you that our friend and colleague Phil Sabelhaus has passed away. Phil was a friend and mentor. Without Phil's leadership and wisdom over the years he was the JWST project manager, we would not be where we are today. 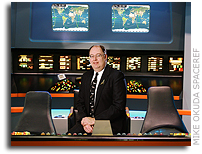 The Flight Control Room at the JWST Mission Operations Center will be named in his honor. When thinking of the right words to describe Phil, I thought of the song "Oysters and Pearls" by Jimmy Buffett, which is about the differences between people who love to lead and take risks and those who are content with following." By Keith Cowing on February 10, 2017 8:16 PM. "Before his speech outlining the revised stance on the Space Launch System, Mr. Stern said his primary goal is "taking this off the table" as a divisive issue while White House aides formulate new NASA priorities. Looking ahead, he said, "there is plenty of market share to go around" to support a wide range of commercial and government launch systems." "Theoretically, then, the United States could have three heavy lift rockets at its disposal in 2020. If the reusable Falcon Heavy costs $200 million per flight, and the reusable New Glenn costs $200 million, while an expendable SLS rocket costs $1.5 billion, the agency - and by extension Congress and the White House - will have an easy choice to make. One could argue at that time that NASA should never have spent in excess of $10 billion developing the SLS. But the bottom line is that, six years ago, Congress did not believe in the capacity of SpaceX to build a heavy lift rocket, and Blue Origin's intentions were not known at that time. So Congress bet on NASA and its traditional contractor Boeing, and the agency kept its large base of employees intact." "Alan Stern, the chairman of the board of directors for the Commercial Spaceflight Federation (CSF), publicly announced the organization's support for the rocket at a conference in DC. ... However, Stern says that the extra capability of SLS will enable missions and partnerships with the private sector that cannot be achieved on commercial heavy-lift vehicles that are currently in development. Because of this, he wanted to get this perception "off the table" that the Commercial Spaceflight Federation is strongly against the vehicle when the organization is actually in favor of it. Stern sees the potential of the SLS being used to put something like a commercial lunar outpost on the surface of the Moon (that is if NASA sets its sights on returning to the Moon again)." Keith's note: Nonsense. This is not what I am hearing from CSF member companies. A number of them are not confortable with this decision and feel that they were pushed into it. SLS is a government-funded, congressionally-mandated rocket with no chance of ever recouping the billions spent to develop it. It can never compete in a true commercial sense unless the government decides to fix prices to make it fit. Saying that the private sector is not interested in developing heavy lift launch systems is utterly inaccurate and flies in the face of plans announced by CSF members SpaceX and Blue Origin. Stern may think he has "taken the issue off of the table" but it will jump back onto on the table in Congress as soon as the hearings start. Continue reading Commercial Spaceflight Federation Sells Out and Endorses SLS (Update). By Keith Cowing on February 9, 2017 10:30 PM. "[Planetary Society's Casey] Dreier cautions that the latest glimpse of potential Trump space policy may be just that--a peek into the internal debate over NASA's mission, rather than a clear roadmap for the space agency's future. ... Human spaceflight programs are expensive, and risk overshadowing such projects. "Science always tends to suffer when human spaceflight programs go over budget," Dreier says." Keith's note: Of course Casey Drier omits the flip side of this statement - when space science missions go over budget (crashing Mars probes in the 90s, James Webb Space Telescope, Mars Science Laboratory, Mars 2020 rover etc.) Space Science tends to suffer much, much more - and it is self-inflicted. By Keith Cowing on February 9, 2017 9:11 PM. "Congressional Democrats are rallying behind a bill to protect federal scientists from attempts to interfere with scientific discourse and dissemination of research results. Senator Bill Nelson (D-FL) yesterday introduced a bill (S.338) that would codify existing policies at some two dozen federal agencies. Those policies stem from a 2009 executive order from former President Barack Obama that required them to spell out how they would safeguard scientific integrity. The policies have dribbled out over the last 7 years." By Keith Cowing on February 9, 2017 9:56 AM. "Former House Speaker Newt Gingrich, another commercial space evangelist with close ties to Trump, is also pushing the White House to embark on a major effort to privatize U.S. space efforts. "A good part of the Trump administration would like a lot more aggressive, risk-taking, competitive entrepreneurial approach to space," Gingrich said in an interview. "A smaller but still powerful faction represents Boeing and the expensive old contractors who have soaked up money with minimum results. "It is a big fight," said former Republican Rep. Robert Walker of Pennsylvania, who drafted the Trump campaign's space policy and remains involved in the deliberations. "There are billions of dollars at stake. It has come to a head now when it has become clear to the space community that the real innovative work is being done outside of NASA." By Keith Cowing on February 8, 2017 9:27 PM. "But the two companies have used different strategies to keep clients. ULA, a collaboration between Boeing and Lockheed Martin, has a flawless launch record. They've never lost a rocket, but safety comes at a cost. According to ULA's RocketBuilder tool, strapping your satellite to one of its Delta V [note: should say Atlas V] rockets will cost you a minimum of $109 million. SpaceX advertises the same service starting at $60 million, and that'll come way down once Elon Musk starts selling launches on used first stage boosters. "SpaceX is like a jackrabbit, and ULA is a buffalo that realizes it needs to be a jackrabbit," says Keith Cowing, a former NASA employee who runs the blog NASA Watch. SpaceX cuts costs by building all its own stuff, innovating quickly, and being able to shuttle payloads right out of the gate." By Keith Cowing on February 8, 2017 8:08 PM. "Despite its significant presence across the Agency and its criticality to the success of the Agency's multi-faceted mission, NASA has not adequately defined OT [operational technology], developed a centralized inventory of OT systems, or established a standard protocol to protect systems that contain OT components. NASA needs to know which systems incorporate OT components because applying traditional IT security practices to OT systems can cause the underlying systems to malfunction. ... NASA also lacks an integrated approach to managing risk associated with its critical infrastructure that incorporates physical and cyber security considerations in all phases of risk assessment and remediation. Specifically, the security of physical and cyber components of NASA's critical assets is managed with minimal collaboration among key Agency stakeholders and does not involve the Office of Strategic Infrastructure, which manages the supporting infrastructure associated with critical assets. This disjointed approach has led to duplication of effort and gaps in security planning and risk remediation at both the Agency and Center levels." By Keith Cowing on February 8, 2017 6:59 PM. - Bridenstine is presenting a laundry list of things China is doing/planning in space that America no longer does. - Bridenstine: when we started paying Russia for Soyuz seats cost was $21m. Now it is $80m. "We are being gouged"
- Bridenstine: need to update regulatory environment for space industry. FAA AST must be adequately funded. Continue reading Rep. Bridenstine Speaks at FAA Space Commercial Space Conference. By Keith Cowing on February 7, 2017 9:06 PM. "Throughout his success, Neil always found time to share his achievements with others. Following in the footsteps of his father, an astronomer who helped dissident scientists during the Cold War, Neil and his family were active volunteers in disadvantaged communities around Goddard. In 2005, he helped develop an internship program that allowed local high school students with hardships to work in his labs. "Neil leaves behind a legacy only he could have created, and words cannot adequately express our grief for this great loss." By Keith Cowing on February 7, 2017 9:01 PM. "At this time, emergency personnel have identified damage to building numbers 103, 350 and additional structures. Building 103, Michoud's main manufacturing building, has roof damage in several areas. Approximately 200 parked cars were damaged, and there was damage to roads and other areas near Michoud." By Keith Cowing on February 7, 2017 6:18 PM. By Keith Cowing on February 7, 2017 6:05 PM. "The Pima County Board of Supervisors voted 3-2 Tuesday morning to appeal a judge's ruling that said the county broke the law in its $15 million deal with the space balloon company World View. Supervisors Ally Miller and Steve Christy voted against appealing the decision." Keith's note: According to a statement provided to NASAWatch by World View: "Those of us at World View remain focused on growing our company. We're excited about our accomplishments and the growing market interest in our technology. World View is a world leader in stratospheric exploration and focused on opening a new stratospheric economy above Earth. Our broad-based business model encompasses both commercial and government markets. Our un-crewed Stratollite vehicle is now widely referred to as a revolutionary platform for high-altitude flight, scientific progress, and commercial access to space, and our space tourism platform will open a new market in the stratosphere and change human perspective for the better along the way. Regarding the ongoing litigation between the Pima County Board of Supervisors and the Goldwater Institute, it's important to note that World View is not a listed party in the lawsuit. Our commitment is to continue to work closely with Pima County, the City of Tucson and the State of Arizona to fully realize the vision of a thriving spaceport and aerospace corridor in Southern Arizona." By Marc Boucher on February 7, 2017 12:44 PM. "While NASA has made improvements since our 2013 audit, continuing weaknesses in its governance and risk management processes have prevented the Agency from fully realizing the benefits of cloud computing and continue to leave Agency information stored in cloud environments at unnecessary risk." By Keith Cowing on February 6, 2017 8:41 PM. "John Hertz, former chairman of the board of trustees of the US-based SETI Institute (Search for Extraterrestrial Intelligence) said in an interview with the Journal of the British Interplanetary Society, that sending signals to alien civilization was dangerous. The expert added that it would be even more dangerous if China received a response from an extraterrestrial civilization. ... Not that long ago, it was reported that three aircraft in China could not land at an airport in Sichuan because of an unidentified flying object. The airport administration denied landing boarding, fearing for the safety of passengers. The aircraft had to be redirected to other airports." Keith's note: Too funny. Pravda (which is aligned with the Russian government) cites American fears about SETI signal detection and suggests that they are linked to a UFO that prevented commercial airline activity in Sichuan, China. Pravda mentions John "Hertz" and the SETI Institute. They might be referring to John "Gertz". They seem to be referring to Gertz's BIS paper (not an "interview") "Post-Detection SETI Protocols & METI: The Time Has Come To Regulate Them Both". This paper makes no mention of UFOs, airliners, or Sichuan but does say "Should the Chinese achieve an ET detection separately from Breakthrough Listen, it is unknown whether they would share the news with the rest of mankind or, alternatively, designate it a state secret." Gertz is worried that China might withhold information about a SETI contact. He goes on to say that "Pursuant to Article IX of the Space Treaty, METI [Messaging to Extra-Terrestrial Intelligence] would arguably be illegal. Consequently, on its face, it would seem that organizations or individuals attempting to conduct METI might be enjoined in a court of law." He adds "However, the immediate release of the coordinates of a transmission begs an unauthorized and premature response. Religious groups might send their parochial messages, while Kim Jong Un might send his." So it is not illegal to listen to E.T. but it is illegal to talk to E.T. - so who enforces this? The purpose of SETI is to listen for messages from extraterrestrial civilizations - right? If sending of messages is illegal and thus prohibited then wouldn't other intelligent civilizations adopt the same stance? If so why even do SETI in the first place? No one will be transmitting - and there will be nothing to listen to. Besides, its too late. We have sent two interstellar spacecraft out of the solar system with maps of how to find us - and we have been yelling "we're over here" to the universe for a century via radio. Indeed SETI guru Frank Drake deliberately said hello to globular star cluster M13 from Arecibo in 1974. So Gertz et al are a century too late - and if Pravda is to be believed, E.T. has already found us. Beam me up. By Keith Cowing on February 6, 2017 5:49 PM. "Two top Republicans on the House Science, Space, and Technology (SS&T) Committee are urging quick passage of the 2017 NASA Transition Authorization Act. ... House SS&T Chairman Lamar Smith (R-TX) and Rep. Brian Babin (R-TX), who chaired the Space Subcommittee in the last Congress and is expected to do so again, both spoke at a Space Transportation Association (STA) event this evening. Smith said he hoped for action in the Senate in the next few days." By Keith Cowing on February 6, 2017 10:18 AM. "TS: Where do you fall on climate change? DG: My own belief is that global warming is real, that it is happening. . . . After all, the Earth's climate has oscillated clearly in the past. We expect not stability, but oscillation. The evidence I've seen has not convinced me that the cause of this global warming or an appreciable contribution [to it] is human activity. But not until I spend a lot more time with the topic . . . would I be in a position to give anybody advice on it. ... The fact is, the Earth is a very, very large object, and scientists especially think of themselves as gigantically important, and pushing culture around, and changing civilization--which they do, occasionally, to some extent. But I think some of them haven't fully grasped what a gigantic proposition it is for measly human activity, whether it's good or bad, to change something like the climate of a planet in the Solar System." "TS: Did climate change come up at all during that first conversation? WH: Very briefly. I said, 'I'm sure you know my position that I think climate change has been tremendously exaggerated--its significance. Climate is important, always has been, but I think it's become sort of a cult movement in the last five or 10 years.' So in just a sentence of two, I said, 'That's my view of it.' And he said, Well, I agree with you. But that's all we discussed." By Keith Cowing on February 6, 2017 9:26 AM. "NanoRacks, LLC will partner with Boeing on the building and installation of the first commercial airlock module, which will attach to the U.S. segment on the International Space Station (ISS). In May 2016, NanoRacks and NASA signed a Space Act Agreement in order to install a private airlock module onboard the International Space Station - the first in station history. The NanoRacks Airlock Module will be both a permanent commercial uncrewed module onboard International Space Station, and also a module capable of being removed from the space station and used on a future commercial platform." By Keith Cowing on February 5, 2017 5:15 PM. "Growing tension between the two approaches is highlighted by a Jan. 23 email from Charles Miller, a member of NASA's original transition team, to former House Speaker Newt Gingrich, a confidant of Mr. Trump who also served on a higher-level transition team. In the memo, Mr. Miller advocates that NASA "hold an internal competition between Old Space and New Space" to determine the best and least expensive way to return to the Moon. "If this initiative can be approved quickly by the White House, and appropriately funded," he emphasized, there could be "private American astronauts, on private space ships, circling the Moon by 2020." According to the email, Mr. Miller, a former NASA official, says he "rewrote the 80+ page" original transition report to emphasize commercial space partnerships with the agreement of White House aide Erik Noble. ... In an interview, Mr. Miller said his proposals, which he believes were forwarded to other White House aides, didn't target, seek to downgrade or negatively affect SLS. The recommendations about the program were "very neutral," he added, and didn't affect it "one way or the other." Mr. Miller said he was asked by Mr. Noble "to help with fixing a draft document," and "I didn't consider it out of bounds." Keith's note: NASA paid Miller to do a study on this topic in 2015. As for this whole "Old Space/New Space" thing. I can't wait to see how Miller et al define these two terms. Despite frequent use of these terms amongst space advocates no one has come up with a consistent/coherent definition. As such I am trying to imagine how you can have these two imaginary camps compete with one another. How does one certify that they are New Space or Old Space? "This study's primary purpose was to assess the feasibility of new approaches for achieving our national goals in space. NexGen assembled a team of former NASA executives and engineers who assessed the economic and technical viability of an "Evolvable Lunar Architecture" (ELA) that leverages commercial capabilities and services that are existing or likely to emerge in the near-term. We evaluated an ELA concept that was designed as an incremental, low-cost and low-risk method for returning humans to the Moon in a manner that directly supports NASA's long-term plan to send humans to Mars." By Keith Cowing on February 4, 2017 6:23 PM. "That tweet is fake. It's just someone having fun," said NASA social media manager John Yembrick. He said space station tweets are managed from the ground in Houston, and that the offending tweet came from a bogus account. 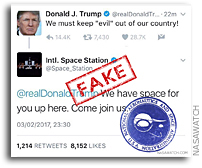 The social media team at the Lyndon B. Johnson Space Center in Houston flagged the tweet last night and verified it wasn't real, Yembrick said." Keith's update: According to NASA PAO the NY Post did not call NASA to confirm the validity of this tweet first. Indeed, the NY Post posted originally posted a story as if this was a real thing. Then again, we are living in the Trumpiverse. By Keith Cowing on February 4, 2017 4:07 PM. 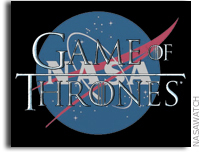 Keith's note: NASA has a Space Act Agreement with the company that runs the Super Bowl. The agreement specifies what each of the signatories will and will not do and how approvals will be provided. JSC has been doing whatever they want and simply ignores the agreement - as well as the NASA Office of General Counsel and PAO at NASA HQ. JSC flew a jersey from every NFL team to the ISS with "NASA" overtly on each shirt. When someone wins the game they will tweet pictures of crew members wearing the jersey of the team that wins. So much for what the Space Act Agreement says. Doing education and public outreach with large events such as this is fine and should be encouraged. Other events would love to have a chance to get this exposure. But when they approach NASA any interaction such as this is always predicated upon having an agreement with NASA. Why even bother to have these agreements if NASA just ignores them? Potential Set Back For World View? By Keith Cowing on February 4, 2017 1:24 PM. "A judge in Arizona has struck down Pima County's $15 million development deal with World View Enterprises for a stratospheric balloon launch facility near Tucson. Thursday's ruling by Pima County Superior Court Judge Catherine Woods dealt a setback to World View's plans to send tourists and payloads to heights above 100,000 feet." "According to Judge Catherine Woods, the County was required to have the building appraised, hold a public auction, and set the lease rate no lower than 90% of the appraised value. The County ignored those requirements; therefore, the lease with World View will be cancelled. The Goldwater Institute filed a lawsuit against the County on behalf of Pima County taxpayers." "To be certain, the view will be spectacular for everyone aboard. But there is much more to the potential of the World View balloon than just flying human passengers to look out the window. While the specifics are still being worked out, a range of payload opportunities are under consideration." Keith's note: World View provided the following statement to NASAWatch: "The recent court ruling does not affect World View's current business operations. We remain focused on building our company and are excited about our recent R&D accomplishments and the increased market interest in our uncrewed Stratollite fight platform. While World View was not a listed party in the lawsuit between the Goldwater Institute and Pima County Board of Supervisors, we are committed to working closely with Pima County, the City of Tucson and the State of Arizona to fully realize the vision of a thriving spaceport and aerospace corridor in Southern Arizona." By Keith Cowing on February 3, 2017 11:48 AM. "United Launch Alliance is again cutting jobs as it seeks to become more price-competitive with Elon Musk's SpaceX and other rocket companies. The Centennial-based rocketmaker, the largest space launch contractor to the federal government, is seeking voluntary departures to trim an unspecified number of positions. ULA said it isn't specifying the number because it considers that competitively sensitive information. The company shed 350 jobs last year through a combination of voluntary buyouts and layoffs and said last summer more cuts would be coming this year." "Musk has been blunt about wanting to send humans to Mars, joking that he'd even like to die there, "just not on impact." But getting there is going to require a lot of capital. SpaceX is still a small player when it comes to securing lucrative government contracts from NASA and the Department of Defense, the majority of which still get handed to longtime commercial partners such as ULA, says former NASA administrator Lori Garver." By Keith Cowing on February 3, 2017 10:55 AM. "Keith Cowing has a message to the "rogue" government employees publishing "alternative" news about their departments on Twitter and elsewhere: "Welcome! Welcome to the revolution. Let the leaking begin!" Cowing has been at it for a long time. His NASAWatch.com is a precursor to Twitter accounts like @RogueNASA, @Alt_CDC, and @AltHHS. They are all trying to do the same thing for their organizations: Protect them. "My website started when there was a threat to downsize NASA by 10 percent," Cowing said. At a National Academy of Sciences meeting, a NASA senior manager referred to "fear as a tool in corporate downsizing," Cowing recalled, "and I said, 'That's it. I'm going to say something.' And that's how it started." "What does RIF really stand for? According to Keith Cowing's NASA RIF Watch Web site, the answer is "Resistance Is Futile." On the site, Cowing cut and pasted NASA Administrator Dan Goldin's face onto the body of a "Borg," the race of villains from television's "Star Trek: The Next Generation" who attempt to destroy Earth and enslave its people. Cowing, a former NASA employee who quit in 1993 because he didn't like the way the agency was being managed, launched the RIF Watch site in April to provide information for NASA employees whose jobs are at risk as the agency's budget shrinks and it is asked to carry out its mission with fewer employees. He's not alone in his effort to supplement--and circumvent--official agency information sources. Rogue webmasters have set up sites for IRS employees and Postal workers. And an online magazine has devoted a section to let federal employees of any agency sound off about what ticks them off." By Keith Cowing on February 2, 2017 5:01 PM. "NASA has yet to receive specific marching orders from the Trump administration, but you have voiced concerns. What is on your mind? I'm having a difficult time adjusting to the turmoil of the first week of the Trump administration. Coming out of NASA and being a former military commander we are very dependent on understanding what is going on in the environment and understanding the need for climate data before we can deploy Marines and sailors and airmen. Finding an administration that doesn't understand that and day-by-day seems to be curtailing the availability of valuable data to decision makers concerns me. We provide a lot of (climate and environmental) data through over-flights and satellite data. That's what I think is threatened if we're not careful with the policies of the new administration." By Keith Cowing on February 2, 2017 3:59 PM. "The Government Accountability Office's preliminary findings reveal a pattern of problems with turbine blades that pump fuel into rocket engines, these officials said. The final GAO report, scheduled to be released in coming weeks, is slated to be the first public identification of one of the most serious defects affecting Falcon 9 rockets. The crack-prone parts are considered a potentially major threat to rocket safety, the industry officials said, and may require redesign of what are commonly called the Falcon 9's turbopumps. The National Aeronautics and Space Administration, they said, has warned SpaceX that such cracks pose an unacceptable risk for manned flights. A SpaceX spokesman didn't have any comment." ... "The final GAO report also will to delve into unrelated issues that threaten to delay initial launches of manned capsules by SpaceX and rival Boeing Co. Echoing conclusions of other studies by outside experts, GAO investigators have determined that both companies are likely to miss a 2018 deadline to start regular missions ferrying astronauts to the international space station." By Keith Cowing on February 1, 2017 12:23 PM. "Rebalancing NASA's portfolio and setting course for its future successes will also be a key priority this Congress. ... Constancy of Purpose within NASA: The Committee will continue to ensure that the National Aeronautics and Space Administration pursues a balanced portfolio of programs reinvigorated with bold exploration objectives. Building upon the progress made towards development of the Space Launch System, Orion, and the commercial crew and cargo programs, the committee will ensure NASA stays the course and leads the world in not only space exploration, but also space science." 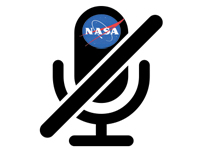 Is NASA Going To Push Back - And If So Against What? By Keith Cowing on February 1, 2017 9:36 AM. "Presidents appoint the heads of agencies and a few officials at the top of each department, but the great majority of those who implement any administration's agenda are civil servants who enjoy legal protections meant to encourage them to blow the whistle on fraud and corruption. Short of formal whistleblowing, workers are finding small ways to express their opposition. At the Justice Department, some career civil servants asked their bosses whether they were allowed to protest their new president by marching or contacting a member of Congress. The answer was yes, if they did so on their own time and in their personal capacity. The day after the November election, the department's ethics office said workers could wear clothing that contained a political message. One lawyer who had worn a Hillary Clinton T-shirt beneath another layer of clothing said that once the advice was issued, "I took the layer off." In the past few days, protest accounts have popped up on social media from employees at several agencies." By Keith Cowing on February 1, 2017 7:56 AM.